That's why you've invested in the security of your network with advanced technologies and software to keep the bad guys out. But technology alone won't help you overcome the weakest link in your network - the people you entrust to run your business every day. While cybercriminals are getting smarter, it isn't their ability to infiltrate your technology that should worry you the most. It's their ability to convince your trusted employees to click on a malicious link, open a booby-trapped attachment, or reveal key company information. That’s the ability that makes them such a serious threat. The truth is that it doesn't matter if you have the best lock in the world, if someone leaves the door open. So how do you build a strong cybersecurity culture in your organization? How do you make sure everyone knows they need to keep the door closed at all times? First things first… you need to embrace the idea that cybersecurity is NOT just an issue for your IT team. Cybersecurity should be the responsibility of your company’s entire leadership team. Leadership at your company is responsible for leading, and this is just as true for cybersecurity as it is for eliminating sexual harassment and hostile work environments. Is leadership at your company expected to actively engage in decision-making for processes? For growth strategies? For loss prevention? For customer satisfaction goals? Cybersecurity is every bit as much of a risk to your business as a bad growth plan or processes that waste time and money. With one major difference… it has the potential to happen in every single department, across all managers and team members. Every one of your senior leaders need to view cybersecurity as an opportunity for more risk-management practices in their department. You’ve likely put a lot of thought into creating your company’s culture and a lot of effort into cultivating that culture. And you’ve just as likely expected everyone in leadership to put just as much thought and effort into it. Why wouldn’t you expect your leadership to also promote cybersecurity? It can’t stop there, though. Your executives need to realize they themselves are your company’s biggest targets for cyber-criminals. Partially because they are the most likely to have, or have access to, high-level data, but also because they are the most mobile and more likely to be working away from the office. As one security report points out, CEO’s are most likely to be hacked when working outside of the office. As people who are both in possession of the most sensitive company data and the most available to hackers, your leadership is the ideal target for a hacker. Changing how your company’s leadership team thinks about cybersecurity is the first, and most important, step in creating a cybersecurity culture. Too many people tend to think of cybersecurity as something that is separate from our day-to-day responsibilities. It's something that happens ‘over there’ in the IT department. But the reality is that every employee can affect how secure the company is by what they do or don't do every day. To develop a strong cybersecurity culture, you need to convey the fundamental truth that security is everyone's responsibility. In fact, security needs to be baked into everything a company does and tied to each employee's job responsibilities. Not everyone that you hire is going to come from a previous company that embraced and valued cybersecurity as a culture. Or even as a process. 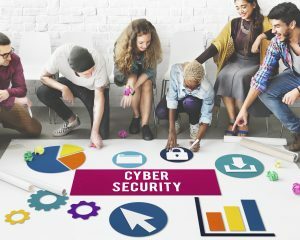 To make sure every employee is trained in proper cybersecurity procedures, specific to their job, from day one, add that training to your new hire onboarding process. Let them know from day one that they are coming into a company where cybersecurity is so important, you train them on it before you even put them in front of a computer or mobile device. If we're going to make everyone responsible for cybersecurity, everyone needs to understand their role and how they can help. That's why it's so important to build awareness around security and go over key concepts on a regular basis. Since security threats change constantly, scheduling security education on at least a quarterly basis is essential. We recommend working with your IT service partner to identify potential security threats and develop security education that addresses those issues. Of course, none of your efforts are likely to succeed, if you don't make the process of embracing a security culture engaging and fun. 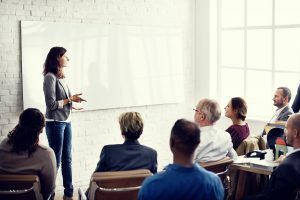 While security is a serious topic, there's no reason that the education process needs to be a series of boring lectures or dull PowerPoint slides. Using your imagination and a bit of creativity can go a long way to helping your team not only remember the concepts presented, but actually implement them in their day-to-day jobs. Do you remember how hard it was to stay awake when that monotone college professor stood up there and droned on and on… and on… and on? You probably weren’t always successful at it. You certainly weren’t likely to actually learn and digest what that professor was trying to teach you. And your employees are no different. Keep it short and sweet. 77% of employees learn better from game-based training. Use gamification and interactive elements like points, badges and leaderboards to encourage your team to take what you just taught them and actually use it outside of the training. Even if you decide not to implement any type of game-based challenge, you should still reward your employees when you see them implementing something from your cybersecurity training. It doesn’t have to be big rewards either. Sometimes the most valued reward is simply a hand-written note thanking them for being conscious of the company’s cybersecurity and praising their efforts. Or schedule mock tests like phishing simulations to see how many employees take the bait. Occasionally, you might even consider going all out and creating a movie, game, or political theme for your training events. You get the idea. Make it fun and it becomes something they actually want to pay attention to instead of sneaking in some Candy Crush time on their phone. Laying the groundwork for a strong start towards cybersecurity is great, but a cybersecurity culture will not grow on its own. The process must be nurtured and fed in order to thrive and truly become part of your organization. Here are some things you can do to nurture the process and continue to improve. Give your team time to absorb your training before imposing accountability. You don't want to cultivate an "us" versus "them" attitude, where employees are pitted against one another. Or worse yet, against management. Everyone in the company will make a mistake when it comes to security. And you don’t want employees trying to hide their mistakes. Encourage everyone to ask for help when they make a mistake. And to help when others have made mistakes. When employees can band together against the bad guys, everyone wins. When mistakes happen, use them as a teaching tool, rather than sweeping them under the rug or placing blame. This transparency highlights the need for continuing training, and provides opportunities for improvement. Part of developing a supportive security culture is giving everyone a chance to express their concerns or offer suggestions. Give them the opportunity to ask questions or even propose an alternative way to accomplish your goal. This creates an inclusive atmosphere that gives employees greater ownership of the process. Be sure to recognize employees who do the right thing. Host monthly contests that reward security milestones to keep employees engaged. Recognize employees who have discovered a new phishing email or averted a security crisis. Reward them with lunch or a gift card. Take pride in them and celebrate their accomplishments! To promote cybersecurity as a collaborative need, break down the barriers between departments wherever you can. This encourages employees to discuss their challenges with one another and often leads to better security awareness throughout the company. Identify and take advantage of employees who are enthusiastic about security issues. These security advocates can provide on-the-spot training to co-workers to keep security training on track and provide motivation for others to follow their example. You might want to even consider providing advancement opportunities to employees who truly have a passion for security by investing in advanced training or degree programs. Create systems and procedures to regularly evaluate both people and technology and share the results with your staff. This helps establish a baseline, track improvement, and provide transparency, so everyone understands the needs and goals of the company. While it won't be easy, building and sustaining a strong cybersecurity culture in your organization is well worth the effort. Technology and software have their place in the war against hackers and data theft, but having all eyes on deck will help you discover potential threats sooner, respond more quickly, and keep your network and your business safer in the long-run.